Good Luck to the throwers competing in this weekends USA OUTDOOR NATIONAL Championships. This year's competition is a World Championship Qualifying event and will be held in Des Moines, Iowa at the historical Drake University track. MTC's MOLLY GRIEP and KeKe BURKS both freshman at the University of North Dakota have qualified to compete in the Junior Championships (19 and under)for a spot on USA's World Team. KeKe will compete in both the hammer and discus, while Molly will compete in the discus. On the junior mens side, MTC's JASON ZAHN, a freshmen at Ashland University, will compete in the discus. Also competing this weekend is Taylor Smith, senior University of Wisconsin, in the Women's Shot Put. Taylor has helped coach at MTC over the past 2 years. Congrats on qualifying and good luck in competition this weekend. Can't wait to watch. I can't wait to get started today. See you all Monday, June 17. Rain or Shine! Congratulations to the Madison Throws Club throwers who were selected to represent their STATE in the Midwest Senior Spotlight/All-Star Track and Field Meet. The Senior Spotlight meet is competed each year the week after the State Track and Field meet. Seniors at the top of the State Honor Roll are asked to represent their state. Iowa, Wisconsin, and Illinois have competed against eachother annually since 2001. Yep, you can still register for Madison Throws Club this summer, you just missed the early bird savings. Session 2 is nearly full so hurry up. Athletes interested in coming to a single day 3 hour session can sign up throughout the summer. Congratulations to Slinger's Kiley Sabin (jr) on winning the 2013 WIAA State Shot Put Championship. 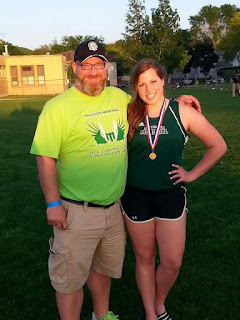 Kiley had started the weekend with a Runner-Up finish in the Girls Discus on Friday, it only got better Saturday as she P.R.d in the Shot Put with a throw of 43' 4.75" to place pressure on the field chasing her, she could not be caught. Outstanding job Kiley! MTC had several other qualifiers in the shot put that had strong finishes their seasons' in the LaCrosse as well. Haley Houser (sr), Stoughton, followed up her 8th place finish in the Discus with a podium finish (6th) in the Shot Put. Along with Kaitlyn Long 9th, Corinne Franz 15th, Sam Noennig 20th. Kiley's STATE Shot Put Championship is the 15th championship for Madison Throws Club throwers. All 6 of Kiley's throws were over 40 feet, the only thrower in this year's competition to do that, she had the 4 best throws in the meet. (prelims1 - 40'11.25, prelims2 - 43'4.75, prelims3 41'4.5", finals4 - 40'1.25, finals5 41'6.75", finals6 - 41'6.75"). Corinne Franz won her second straight WIAA D1 Girls Discus Championship Friday night in LaCrosse. Her final throw of preliminaries of 143'10" was her best throw of the day, she had 3 other throws that were good enough to win the competition, which was competed in a terrible tail wind that did no throwers any favors. As both her club and high school coach, I have seen in person her hard work and dedication to Track and Field, in the circle and in the weight room. I couldn't be more proud! MTC throwers completed a 1-2-3 sweep of the Girls Discus. Slinger's Kiley Sabin (jr) finished 2nd with a throw of 130'0", Hartford's Sam Noennig (fr) finished 3rd with at throw of 126'9". MTC had several other athletes qualify for state and finish the year strong. Haley Houser 8th, Paige Day 11th, Abby Jankowski 18th. With her second gold, Corinne completes a journey that started with Madison Throws Club the summer before her freshman year of high school but will continue at the University of DePaul next year. Congratulations Corinne! And good luck! Corinne's win in the discus is the 14th State Championship won by Madison Throws Club Throwers. Corinne used her first throw (prelims1- 118'8") in the prelims as a safety throw to get a mark to qualify for finals, Her following 5 throws all bested the competition (prelims2 -137'5", prelims 3 - 143'10", finals4 - 135'2", finals5 - 137'6", finals6 - 137'6"). Watch all 6 throws in the video below. I have had the distinct pleasure of working with many throwers through Madison Throws Club. A special congratulations go out to the following throwers on their accomplishments and for blazing a trail for the MTC throwers that follow you. See the list of MTC Throwers who have WON STATE CHAMPIONSHIPS in the throwing events HERE.